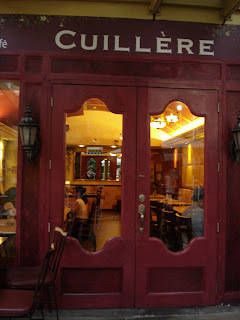 "Welcome to Cuillere", the cheerful server greeted us as we entered the cozy yet formal looking restaurant on lazy sunday afternoon. I had to ask her to slowly repeat the name of the restaurant in order to get the right pronounciation. "It's kwee-yer, Maam, with the silent Ls", she explained. "Kwee-yer" repeating after her...sounds great! One thing I love about dining out is being able to know more about the different cultures and appreciate the beauty of it. 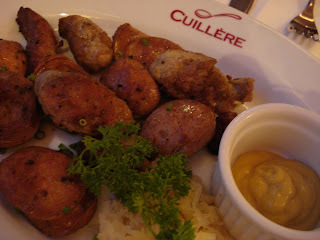 I've been receiving a number of raves about Cuillere and most of it were about its famous carabao milkshake. Sadly, I'm lactose intolerant thus I have to skip this one but nonetheless enjoyed my visit by trying out their best-selling dishes that made Cuillere one of the most talked about restaurants in Serendra. Sausage Platter (P395)-- I loveeeee sausages so how can i say NO to an opportunity to try an assortment of sausages served with, my latest discovery turned favorite, Saurkraut, and creamy mustard? However, I think I got a little too excited blowing my expectations way up there and later realizing that this dish was just a-ok but nothing remarkably spectacular. Some pieces were a little bit overcooked that it turned out a bit dry and, sad to say, boring. 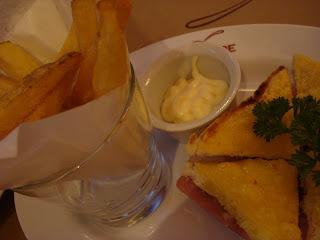 Monsieur Cuillere (P275)-- I love Croque Monsieur because it turns a simple ham and cheese sandwich into a yummy delight! My favorite Croque Monsieur is from Bizu and Cuillere's version was pretty good too! I love the crunchy, salty and super cheezy coating on top of the sandwich which blends well with the flavorful ham and the subtle, melt-in-your-mouth gruyere and bechamel cheese spreads. Paul enjoyed the thick fries served with aioli sauce which he later traded off for good ol' tomato ketchup to lessen the calories (hehe). Late afternoon is the perfect time to sit back and relax at Cuillere. No waiting lines and you even get to pick your own spot because the restaurant is almost empty. In fact, there were only three occupied tables during our visit. The servers were super attentive to all our needs and even patienty answered all our inquiries and made wonderful suggestions as well. Looking forward to my next Cuillere visit and perhaps this time, Paul and I can make it a dinner date to try their mouth-watering Les Petits Steaks au Fromage Bleu (Tenderloin tips and sauteed mushrooms wth blue cheese sauce). Très délicieux!